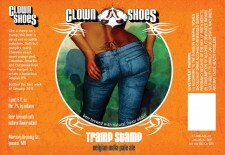 (Ipswich, MA) Clown Shoes is pleased to announce the upcoming release of its newest year-round offering, Tramp Stamp. This Belgian India Pale Ale is as much a work of art as our labels and will begin shipping to stores late next week. Brewed with a complex yet soft malt bill, this beer is all about not so subtle seduction. Tramp Stamp combines the same Chambly yeast and sweet orange peel we use in our Clementine White Ale but kicks it up a notch with the addition of Columbus, Amarillo, and Centennial hops. The marriage between aggressive hops, sweetness from the Chambly yeast and orange peel, and the innocence of the malts create a very unique Belgian IPA-best described as “bodacious”. Tramp Stamp Belgian IPA will be available in 22-ounce “bomber” bottles as well as 1/2 barrel and 1/6 barrel kegs. Clown Shoes beers are currently available statewide in Massachusetts and Rhode Island. Illinois distribution will begin in late-January, while distribution in New York, New Jersey, New Hampshire, and other select East Coast markets will begin in early spring. Be sure to also check out our first-year anniversary beer, Hoppy Feet 1.5, on shelves at select retailers now! Clown Shoes? Long story, but be sure that anything bearing the goofy name and logo will be an amazing sensory experience unmatched by few. The brand was founded in Massachusetts in December 2009 as one of those “lets see what we can do” type projects. What we did was created a gourmet brand that strives to recognize under-represented styles of beer in the market by adding our own little creative twists. Consumers have caught on and are giving the (so far) four year-round and two seasonal beers amazing reviews. Be sure to find Clown Shoes on Facebook and Twitter!